TradCatKnight: Can The US Survive An EMP Attack? While there’s no question that a nuclear strike on the Continental US would be utterly devastating, it’s not the only way a rogue state like North Korea could kill millions of American civilians in one fell swoop. Another possibility that is being studied by lawmakers and Pentagon officials is – like North Korea itself – a vestige of the Cold War. We’re of course referring to an electromagnetic pulse. By detonating a hydrogen bomb in just the right spot miles above the Earth’s surface, the North could permanently damage the US power grid – maybe even take it offline completely. By robbing entire swaths of the US of electricity, the North could precipitate thousands – if not millions – of deaths. The North first threatened an EMP attack over the summer, and North Korean media and its people have mentioned it several times since. Given the success of the North’s missile tests, Congress increased funding for the Commission to Assess the Threat to the US from Electromagnetic Pulse Attack as part of the National Defense Authorization Act back in September. Last month, federal agencies and utility executives held GridEx IV, a biennial event where officials responsible for hundreds of local utilities game out scenarios in which North America’s power grid could fail. Unsurprisingly, with the North Korean threat looming, these discussions took on a whole new level of urgency, as Bloomberg explains. This year, the event took on an added urgency given growing concern with a weapon straight out of the Cold War: an electromagnetic pulse, or EMP, emanating from a nuclear blast - specifically, one delivered by a North Korean missile or satellite detonated miles above the Earth. Though GridEx IV didn’t pose this exact scenario, industry experts concede there’s no clear plan to deal with it. An EMP could damage electronic circuits over large areas, depending on the configuration of the weapon and how high it was detonated, though there’s disagreement over how effective such a tactic would be. Scientists also emphasize that a nuclear bomb that hits a ground target is much more worrisome. Nevertheless, with North Korea’s increasingly successful missile and warhead tests in mind, Congress moved to renew funding for the Commission to Assess the Threat to the US from Electromagnetic Pulse Attack as part of the National Defense Authorization Act. 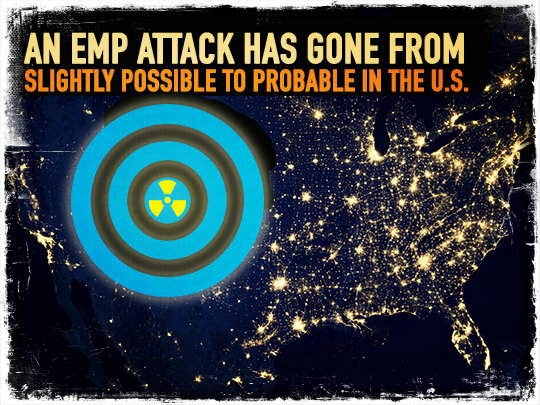 In September, the commission’s top officials warned lawmakers that the threat of an EMP attack from a rogue nation “becomes one of the few ways that such a country could inflict devastating damage to the U.S."
Still, the EPRI report paints a picture that’s hard to ignore. Simulations showed that detonating a nuclear weapon about 250 miles above the Earth using a 1.4 megaton bomb, almost 100 times more powerful than the one dropped on Hiroshima, would likely collapse voltage regionally, affecting several states but not the entire eastern or western networks. “None of the scenarios that were evaluated resulted in a nationwide grid collapse,” the report stated. Recovery time from a high-altitude EMP would depend on equipment damage, something the EPRI said it plans to study next year and “develop cost-effective options for mitigating." Fortunately, the operators of America’s power grids have some experience developing emergency response scenarios for an EMP. As it turns out, an EMP would essentially mimic the effects of an extremely powerful solar flare. Power grid operators are constantly on the lookout for flares, and have theorized what improvements might be needed to make power grids totally resistant. PJM Interconnection LLC, operator of the power grid serving one-fifth of America's population, has a lot of experience protecting systems against solar activity. PJM has also been working with transmission owners to protect against other threats, many of which have two specific characteristics: low probability and high potential for catastrophe, said Mike Bryson, vice president of operations for the Valley Forge, Pennsylvania-based operator. An EMP is one of them. “I don’t think we have an illusion we will prevent it,” Bryson said in an interview. “That’s really the government’s job." Expensive fortifications known as Faraday cages could help diffuse the energy pulse, possibly stopping it from overwhelming a power grid. Another option would be installing automated control systems that would regulate the grid’s response to an EMP, potentially allowing it to recover more quickly. Duke Energy Corp., one of the country’s largest utility owners, has been working with EPRI to study its threat to civilian infrastructure. Lee Mazzocchi, Duke’s senior vice president of grid solutions, said “we really want to use science and research to validate if and how much an EMP threat there could be." Myths vs. Facts. “It makes little sense to protect the electric grid while ignoring these other critical infrastructure sectors." …But the costs of fending off such an attack would be astronomical – as one scientist put it. Making the entire US power grid immune to an EMP would cost hundreds of millions, if not billions of dollars. As we pointed out back in October, one expert told Congress that an EMP could kill off 90% of the US population. People who lived through the New York City blackout in 1977 will remember how lootings and crime exploded while the lights were out. A similar phenomenon would likely play out following an EMP, as law enforcement would be hobbled and powerless to contain criminal behavior. Think about how Hurricanes Irma and Maria devastated Puerto Rico by knocking out all communication and electricity infrastructure. Three months later, it has yet to be fully restored. Meanwhile, the death toll from the storms is on track to eclipse the thousands who died during Hurricane Katrina.